Album: "All Men Shall Fall"
Δελτίο τύπου: «The story begins back in 2010 when former members of Imagika, Dark Angel, and Eldritch formed Kill Ritual. The band was one that took its traditional Heavy Metal influences and then blended and molded them into a very powerful, modernized machine. The music of Kill Ritual has always been very guitar-oriented and that’s surely due to the presence of axe-slinger Steven Rice. He has been the one singular, constant presence in the band since the very beginning. 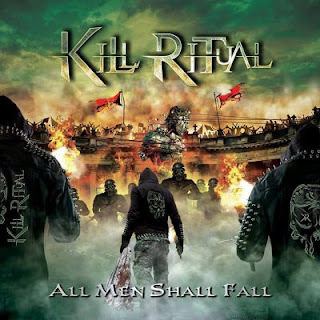 In 2012 Kill Ritual issued their debut album The Serpentine Ritual (Scarlet Records) to much critical acclaim and positive acceptance. That was followed by the 2014 effort The Eyes Of Medusa (Golden Core/ZYX) which one again garnered the band increased attention and accolades. In 2015, changes came to the Kill Ritual camp, the inevitable types that usually become most bands at some point or another. So enters vocalist David Reed Watson (Rage Of Angels, Electric Messiah, D.N.A.) who brought his wide spectrum of emotion-infused banshee vocals to the band. Watson and Rice became the heart and soul of Kill Ritual that fueled the phenomenal 2015 album Karma Machine, an album produced by Steve and mixed/mastered by the legendary Andy LaRocque (King Diamond). The album propelled the band’s status further into the metallic community where increased awareness of Kill Ritual‘s awesomeness grew exponentially with all the right people. Incredible things are happening with Kill Ritual yet again. First off is they have a new album in the can, titled ‘All Man Shall Fall‘, secondly, a solid line-up change with continuing European Tour members, Lotesto and Pegram.